What were you thinking dear father? What was going on in your mind? When you had more beers than the water you daily drink? When you brought home a girl younger than I, what did you think? We would embrace and love her? Dada and I would call her mother? Did you not see this coming? Wow, this is really good! Well done, Esther! What a revelation: “I knew he would treat my heart The way he treated my body”. It is so easy to mistake tenderness for true love as the two can resemble each other so much. Every touch, every kiss can be another lie – another vicious deception. The motivation is entirely selfish as all the man wants is a “taste of black Chai” – he is a consumer and she is a variation of tea – the dark kind. There is a consumer and one that is being consumed. There is no sharing of experience. I am glad that the young woman has realized that she still has “sizzling heat” and spice and is well-tasting, and that the tongue that tasted her is unworthy of her. Es Taa has achieved sublimity. This is of moral and intellectual worth. This is powerful spoken word. This poem is poignant in all ramifications. The poet’s use of the Chai tea as a symbolism for the taking of a young woman’s virginity and innocence by a Master is just affecting. Her voice, it just was silky yet it had the strength of delivery needed to pass this message beautifully. Incredible poem!! I love the subtleties of the prose that actually opened the door to the stark realities of a young girl being defiled. BRAVO Es Taa! Your voice is very authentic and moving. Thank you for sharing. Known by her stage name Es Taa, Esther Karin Mngodo is a Tanzanian poet based in Dar Es Salaam. At the age of 10 she was encouraged by her mother to join the choir, which she did. As the youngest member at the time, Es Taa started off as a Saprano and later on as an Alto. She recently discovered her Tenor voice in a band that ahe has been part of since 2006. Not only is the 26 year old a poet and a musician, but a journalist, a storyteller, a playwright, a social worker, a song composer and a woman passionate about her faith in God. 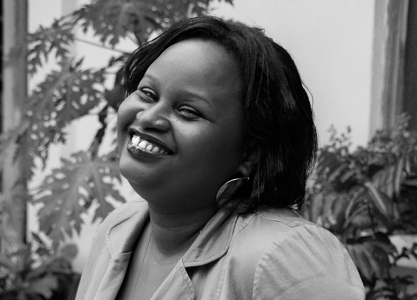 In 2011 she co-wrote a Musical Move: The Time is Now that was staged at The National Museum Theatre in Dar Es Salaam. She recently performed her original poems at The Smart Partnership Dialogue Meeting held in Dar es Salaam that was attended by Commonwealth Heads of States and different dignitaries. Using her own life experience, Es Taa’s passion is to unearth matters that people would rather not talk about openly, to bring healing through authentic lyrics that have been birthed through her own pain, mistakes and the quest of life’s purpose. She also seeks to use art as a tool of social change by addressing issues of human rights and social justice in a way that people can relate to.